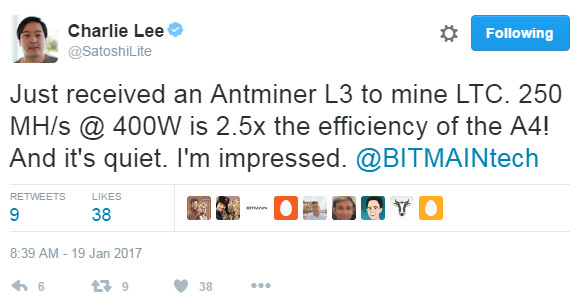 Another interesting piece of information about the popular ASIC manufacturer Bitmain as apparently the company is planning to launch their first Antminer L3 Scrypt Miner. Some of you might remember that back in 2014 Bitmain was planning to launch Antminer L1 Sctypt ASIC miner, but that one never came into existence. Apparently back then the company reached a stage that allowed even without launching a product to continue working and get an even more efficient solution and here comes the L3. There is some information available about the device already, even though it is not yet officially listed on the English website of Bitmain (you can find a product page on the Chinese one). You can find some photos and even some early performance results online from peopel that managed to get some early units apparently, including a tweet from charlie Lee who created Litecoin (LTC) about getting one of these devices. More general availability is expected sometimes in February probably because of the incoming Chinese New Year, so we are going to have to wait some more time. What is the most interesting thing about the Bitmain AntMiner L3 Scrypt ASIC miner is the efficiency that the device not only apparently promises, but also delivers – 250 MHS hashrate with just 400 Watt power usage. This makes is significantly more power efficient compared to its only competitor with a recent generation of Scrypt ASIC hardware available – Innosilicon A4 Dominator (280 MHS at 1000W). The price listed on the product page is 1.825 BTC or a little over $1600 USD at the current exchange rate. Do note that the Antminer L3 ASIC does come without a power supply, but with the power usage the device has it does not require expensive and harder to find power supply, a decent 500W PSU should do just fine. 1) The original order value of $599 will be refunded at 105% value [$629] by bitcoin at current market rates. Customers will receive bitcoin payment. 2) The original order value of $599 will be refunded at 110% value [$659] by bitcoin at current market rates. This will be credited against any new S3/S4/C1 order placed in the web store. 3) The original order value of $599 will be credited at 115% value [$689] against an S5 order placed in the web store. This will be issued in the form of a 15 day coupon, each coupon valued [$344.5]. Please await an email info@bitmaintech.com for further instructions. Though we are sorry that we do not deliver this time, it still turns out that buying L1 from BITMAIN is a very best way to earn more Litecoin. Data Analysis: In the beginning of L1 sales, you only need to pay 115.86LTC to buy one L1 per the LTC/USD exchange rate 5.17 in the early September. However, you will get 193.22LTC under current LTC/USD exchange rate 3.1. And then plus extra 5% value, a total amount you get is 202.88LTC per unit. Return on investment is 75%. If you choose coupon compensation, Return on investment is 91%. It is not very clear weather BitMain has already finished with the development and has actually produced some mining hardware or they are cancelling things before they have actually been finalized. The problem is that after ZeusMiner cancelled their Volcano miner and 3rd generation Scrypt ASICs and now the same happening with BitMain and their AntMiner L1 Scrypt ASIC things do not look that good for Litecoin and other Scrypt crypto currencies. The low exchange rate of LTC at the moment makes older Scrypt ASIC miners not very profitable to run due to their high power usage and with no newer generation more efficient miners announced to be coming soon things could get even worse. The official website of Bitmain Tech has a new product listing for a few days already of a new device called Antminer L1, but there are still no details and specifications published. However the listing for the new device has the speed rating listed in MH/s even though it currently says 0 instead of GH/s rating that we see listed for the Bitcoin ASIC miners that the company sells. Until now Bitmain has only been offering Bitcoin miners, however it will not be a surprise if they have been working on a Scrypt ASIC miner as well and may soon launch such a device. For the moment there are still only speculations about the new device, but hopefully we are going to see an official announcement with specifications and know if it is going to be another Bitcoin miner or a Scrypt ASIC miner. Update: The announcement just came, AntMiner L1 will be a Litecoin miner offering a price of $5 per MHS and will start shipping in December. The L1 miner should provide a hashrate of 120 MHS for Scrypt mining and will have a price of $599 USD per unit with free shipping worldwide, based on 28nm production process it will have a power usage of 380 Watt at the wall. It also seems that the new miner will have support for mining Scrypt-N crypto currencies as well and not only Scrypt ones. 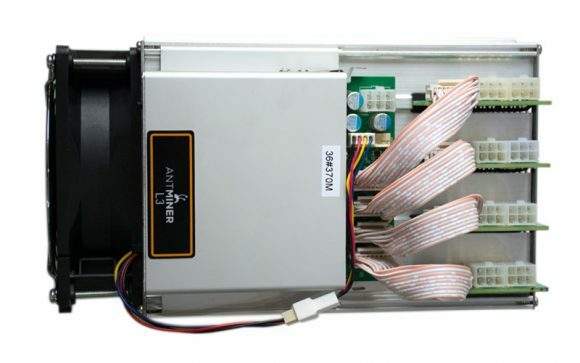 There is also something new about the Bitmain AntMiner L1 miner and that is the fact that the company is essentially accepting pre-orders for a device that should be ready for shipping in about 3 months from now. Up until now Bitmain has announced new products and shortly after that the company started shipping them, so the products were ready when announced and not still in the development stage as is the case with the L1 miner apparently.